Naturally, every library has its share of diet/health books. 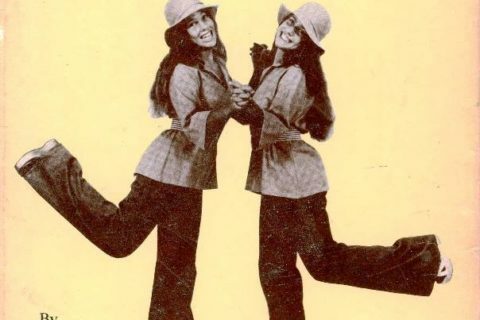 They go in and out of fashion more than, well, fashion. 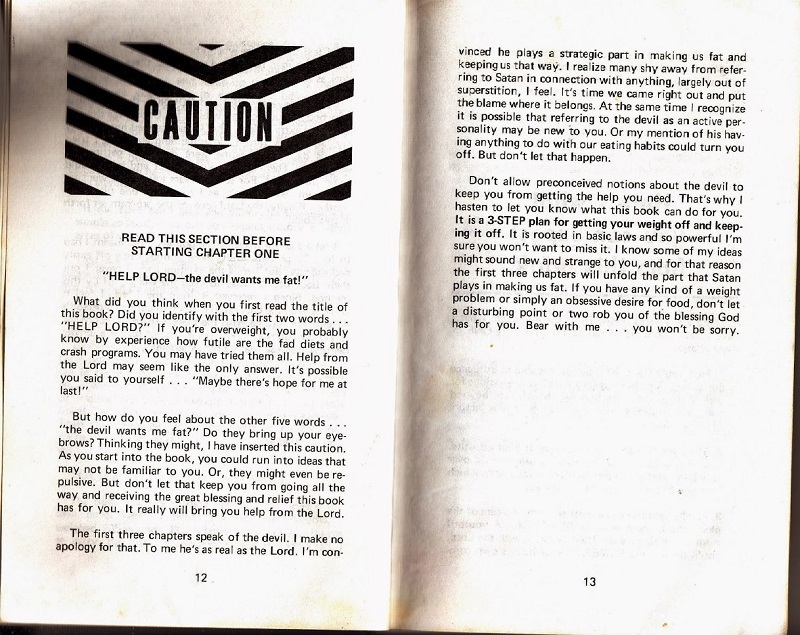 This book takes the extra added bonus of blaming Satan. 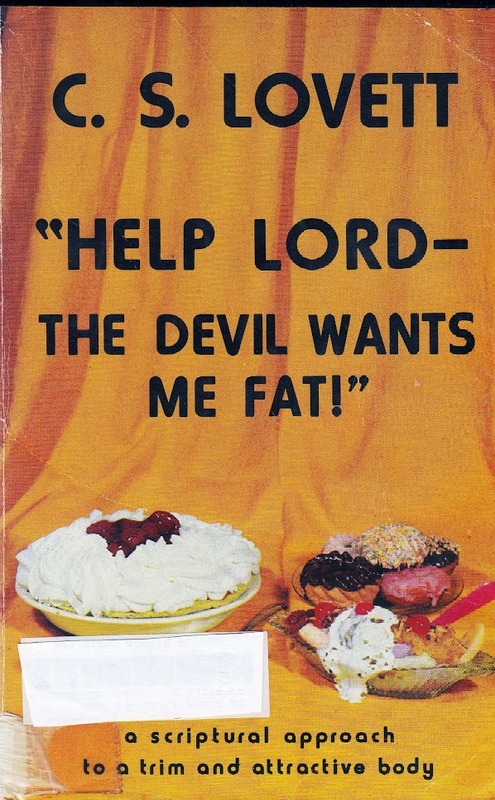 Evidently Satan sits on the Hellmouth with a big plate of cookies tempting all of us into the abyss of fat and calories. 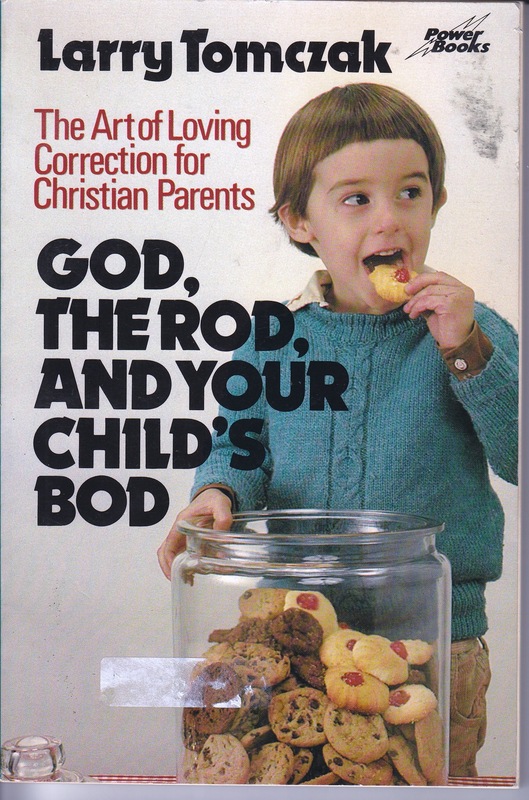 One of the big ideas in this book is about fasting. Obviously not a new concept in religious practice. 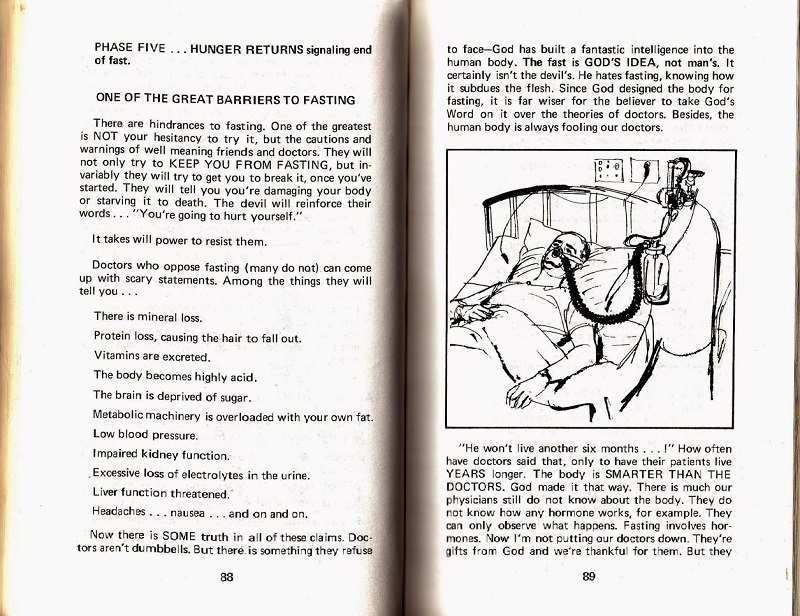 However, the advice about fasting is a little too cavelier about a doctor’s advice. He doesn’t even mention particular health issues where fasting might be problematic. Well now I am thinking that maybe Hell has a better buffet than Heaven. Don’t Surrender to Snack Attacks! Surely fat would be an ecumenical matter? YES!! Well played, Dishwasher Crab. 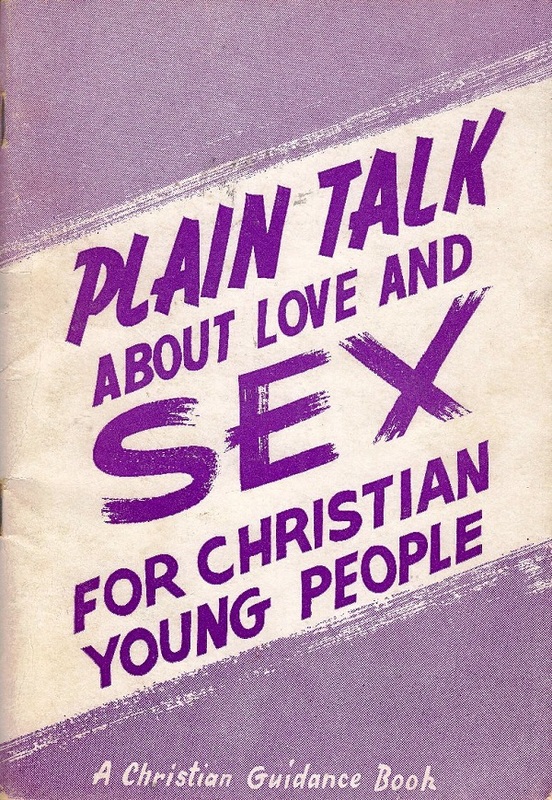 Maybe this book was in fact penned by Sister Assumpta under a pseudonym. 1-“Doctors don’t realize the fast is god’s idea”. Okay then, I’m sure they’ll be super duper on board when you tell them that, and 2-I’m super immature, so HAHAHAHA at “Doing It With the Lord”. I blame overeating on things that would make the religious fanatics want me burned at the stake: When we were a bunch of cave-dwellers about two or three million years ago before the Earth was created and Adam and Eve were born, we had to eat whenever we can to store up body fat whenever food was scarce. We didn’t have ways to keep food from spoiling until we were ready to eat it. We had to go out to hunt and gather. And now even though we have plenty of food, our brains think we’re still in the stone age where going more than a few hours without eating means there is no food around at all and we will starve, and that’s also why fattening food always seems to taste better. It’s not because of some pitchfork-welding guy in a red suit, it’s because of genetics and other (gasp) scientific things! “Subdue the flesh” by fasting. Yes, being “subdued” is typically a side-effect of starvation. 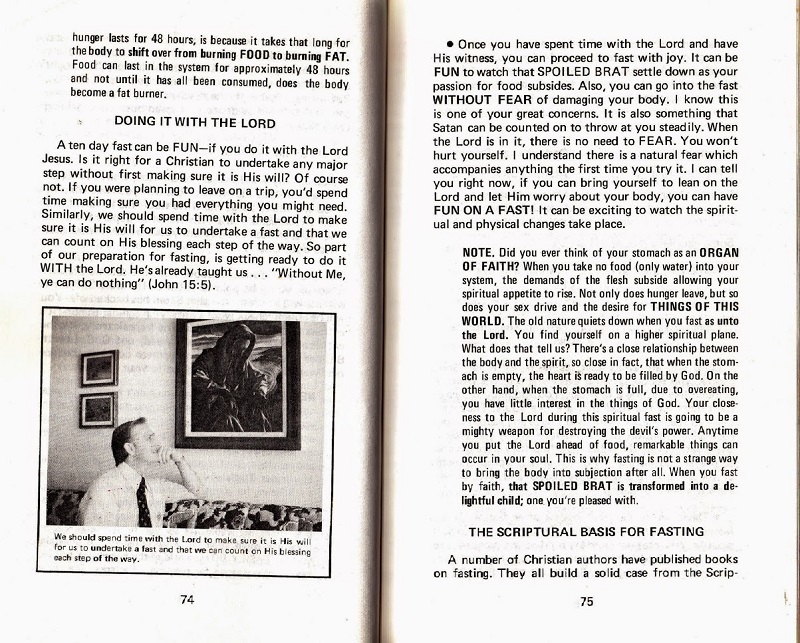 “A ten-day fast can be fun — if you do it with the Lord Jesus,” but first be sure it is according to His will. The author doesn’t explain what happens if the person discerns that the fast is NOT according to His will. I’m imagining something like the plot of “Thinner” but in reverse. So basically this is Christian thinspo? If God doesn’t want us fat, how do you explain church potlucks? 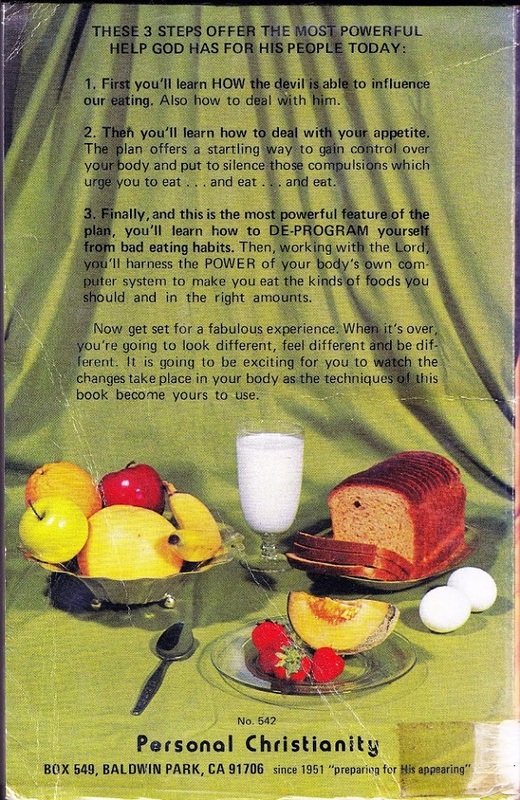 It must not have been easy trying to fast with this book lying around, with all that tasty stuff on the front cover! 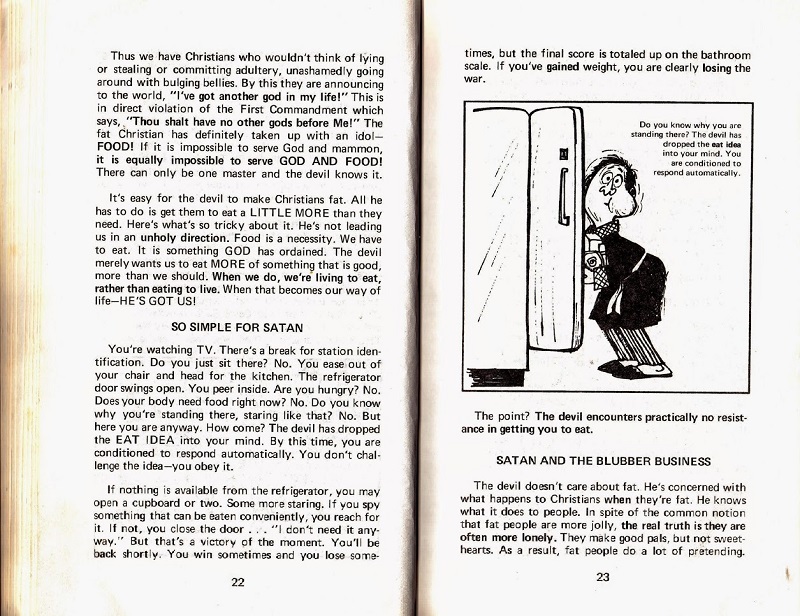 So, Satan has a vested interest in humanity’s gastronomic adventures? 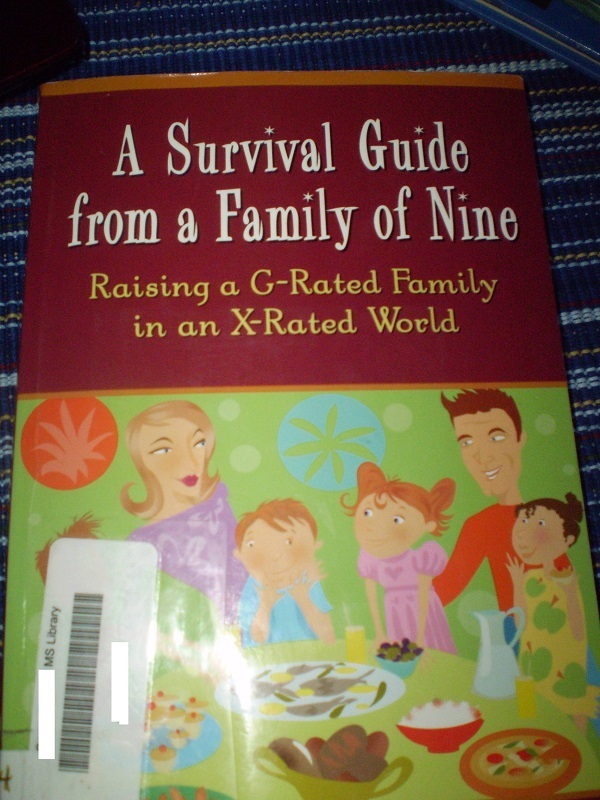 I first read the author’s name as C.S. Lewis and thought, I didn’t know he wrote about that!